The Bolivian-Canadian Clean Water Network (BCC Water Network) is a small not-for-profit society run by a Calgary- and Vancouver-based team of volunteers. Our mission is to help Bolivians improve their livelihoods and strengthen their communities through participatory projects in water, sanitation and small-scale agriculture. We achieve this mission by working with Bolivian-run organizations (COBAGUAL and Jaraña) that implement water, sanitation, and agricultural development projects using low-cost sustainable technologies like the BioSand Filter, latrines, simple greenhouses, water wells, irrigation canals, and rainwater harvesting systems. The projects that we support always have a strong education component, to help ensure lasting benefits. In addition to working with its Bolivian partners, BCC Water Network aims to act as a liaison between different organizations that work on water and sanitation issues in Bolivia with the goal of facilitating the sharing of best practices and improving efficiency. We are members of a Calgary-based NGO coalition called the Fig Tree Foundation. BCC Water Network received the 2008 YMCA Calgary Peace Medal in the International Category for its work. 1) Project beneficiaries actively participate in the project through providing labour, and, where possible, a portion of project financing. 2) Serious efforts are made to involve the local municipal government in the project so that the government can help maintain the project over the long term. 3) Education and follow-up visits are included in the project proposal to help ensure lasting benefits. 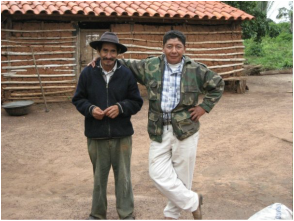 BCC Water Network is a completely volunteer-run organization, meaning that about 85% of all donations go directly to the Bolivian communities where they are needed most. If you would like to support our work and do not require a tax receipt, then donate through Paypal by choosing your desired donation frequency and hitting the 'subscribe' button below, or visiting the 'how to help' portion of this site for more options. Para ver la página web en español, haga clic aquí. To view this website in Spanish, please click here.